Numbers matter. But so do people’s stories. In our last Insight, we talked about developing marketing content that inspires our audience to act. We want people to engage with our content. But more important, we want to increase their participation, whether it’s by filling out a demographic profile, sharing an email address, or joining a study. To do this, we need to provide content that captures their attention, demonstrates that we understand the impact of a disease on their lives, and convinces them to step up. As we create content, it’s good to look at any information that might shed light on what makes our users respond. But what kind of information is most useful for this purpose? Too often, we focus on only one kind. The scientists among us are comfortable with quantitative data: to learn whether we’re headed in the right direction, we look at the numbers. Yet we also need to cozy up to qualitative data: non-numerical information collected in one-to-one dialogues, focus groups, and user testing. 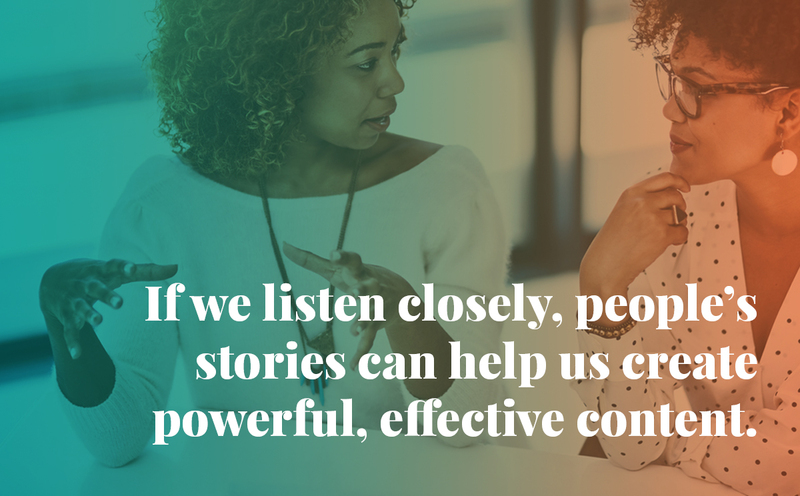 If we listen closely, people’s stories can help us create powerful, effective content. As we develop content for recruiting, qualitative data collection can be a critical first step. Here, it’s about talking to small groups of researchers and potential study participants to learn from their experiences. Because this approach takes time and the information can’t be collected digitally, it sometimes gets ignored. But its intimate nature often yields unexpected insights. At Provoc, we focus on asking both specific and open-ended questions, then listening carefully. What are the top concerns for our audience? What new research might they want to know about? What hopes and fears do potential participants bring to the table? What might we do to make these people feel more secure? We can also gather insights into the potential pluses and minuses of proposed content ideas, as well as IRB objections. How do people respond to images, colors, and typography? Which words and phrases create positive associations? Which words and phrases should we steer clear of? Finally, we invite users to engage with the content to see if there’s anything we missed or misinterpreted. Which menus, buttons, or other navigation options are easier to use? Which options confuse people or slow them down? Which words, phrases, colors, and images do they respond positively (or negatively) to? How does the use of content differ from how we imagined it would? Getting answers to questions such as these can help us connect better with our audience. Take our work for the WeCan Study on the use of medical marijuana with veterans with PTSD. Dialogue with veterans helped us understand that they most often view themselves as ordinary people, not as uniformed service members. In response, we developed imagery that showed vets in casual clothes doing everyday things. These images improved response over previous efforts and within a short time, the study hit its recruitment targets. To spur action, we need to meet our audience where they already spend time, with content that answers their questions and addresses their concerns. Quantitative data can help us make this happen. First, we analyze data from social media posts, websites, and other media. This approach can answer a number of critical questions. Where are people going both online and offline to learn about and talk about the disease, its impacts, and the current research? What disease, research, and treatment topics are people most interested in? What words and phrases do they use in their discussions? This information can help us shape content and target those digital meeting places such as websites and social media platforms where we can connect. In addition, we can gather and analyze demographic information that tells us who our audience is and where they are located geographically. Doing this enables us to target content by gender, age, or location. Demographic data also tells us where we have to work harder to achieve audience diversity. Which wording is associated with more people asking for information about a study? Which wording is associated with more people providing their email address or other demographic information? Which wording is associated with longer engagement, more study sign-ups, or more calls to an information line? Looking at this data, collected over a large number of user interactions, can help us identify more effective content options. It can also shape the development of new alternatives that might do an even better job. It’s part of a continuous cycle of iteration and improvement, made possible by the analysis of both qualitative and quantitative data.